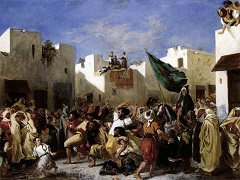 The Fanatics of Tangier is a prime example of the Romantic style of the early 19th century. 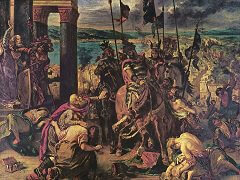 Its chief exponent and unofficial leader was Eugène Delacroix. 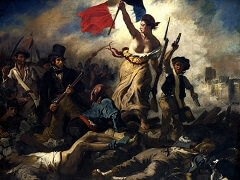 Romanticism arose in part as a reaction against the strict Neoclassical ideals of reason and order. By emphasizing instead the personal, emotional, or dramatic through the use of "exotic", literary, or historically remote subject matter, Romanticists expressed the revolutionary spirit of the age. 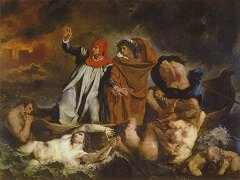 The painting is based on an event that was witnessed firsthand by the artist. 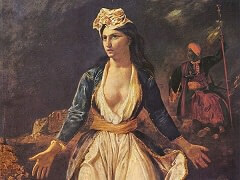 In 1832, Delacroix traveled to Africa with the French ambassador, Comte de Mornay. While in Morocco, Delacroix o bserved the devotional exercises of the Isawas and fanatical Muslim sect, as they thronged the streets of Tangier. 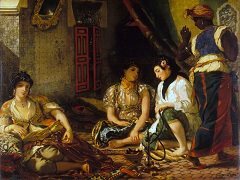 Delacroix made a rapid sketch of these dervishes' actions, which is now in the Louvre. Later in the summer he executed a watercolor, from which this painting was made four or five years later. When exhibited, the work drew praise for its use of color, dramatic subject matter, and realistic treatment, but was generally criticized for its lack of finish, sketch-like quality, and small scale. Tangier was an important meeting place for the Isawa dervishes, who were dedicated to poverty and chastity. They went from town to town performing and asking for alms. At certain times, they gathered outside the towns, working themselves into highly charged emotional states by means of prayer and dance. They then moved through the streets achieving a state of ecstasy through physical contortions and fervent cries.